running in order from top to bottom. Explained in detail below. You have the idea for your novel, and the central plot. This includes what is at stake for the protagonist(s). Love? A glittering career? Survival? Unravelling a mystery? In itself that may leave a rather straightforward story, so it is useful to weave in sub plots to add depth. The simplest is to throw in a love interest but that is rather predictable (and is the Hollywood sub plot of preference). One of the criticisms of a draft version of one of my earlier works was that it needed more fillings in the sandwich, more sub plots to keep the reader engaged. And that's what I'm working on at the moment. I've already blogged about the process of listing what I already have from the previous draft. Next I created a table in Word. I headed it with the protagonist's name, then used headings for each sub plot, however minor. So we have a column for each sub plot, split into rows. The top row is the start of the novel, the final row is the end. Now and again I would create a heading by merging cells, representing some important section of the novel, breaking it into more manageable chunks. For my current novel I have two protagonists, so came up with another set of columns for their sub plots (some of which are similar, but some are different because they're based on the character's own concerns). I printed this out with lots of space and started to fill it in. Sometimes it is obvious that one scene or event should occur before or after another so I wrote it into the box appropriately. These were rough first guesses, able to be moved around. I spent some time on this, occasionally typing it up once the printout got too messy, reprinting it, then continuing. I highlighted scenes that are already written with a red asterisk and crossed them out from the document I created last week - I'll call it the 'existing scenes summary'. Even though they would need re-writing it gave me a good overview of how many scenes I would have to create from scratch. I was left with a number of scenes from the 'existing scenes summary' which I hadn't fitted into the new structure. Often it is because that scene wasn't doing much in terms of the plot. It was just characterisation. The good news is that I could then go through what was left in the 'existing scenes summary' and combine some of those with the unwritten new scenes I required, meaning that I had a headstart, and what had just been characterisation would now be background for advancing the main plot or sub plots. The document was messy again, but a few steps closer to being a viable structure. The next step was to work through it. The table was so busy that it needed simplifying, and the sequence of events tightening up. So I numbered each cell on the printout with the order it should occur. I could use the same number for multiple cells/events if they occurred in the same scene. Once that was done I went back to the master table on my PC and made sure there was the same number of rows as there were numbered cells. I then moved the contents of each cell onto the row with the same number. It means many rows had more than one box filled in, which is great as the scene is then advancing more than one plot and is earning its keep. And as I read down the table, scenes were in the order they would appear in the novel. The image at the start of this blog post gives an idea of where I was up to (I have changed it a bit to avoid spoilers for my next novel! Luckily most entries are quite cryptic and only mean a lot to me.) It is just the start of a document that runs on for many pages. There is more work to do but I find this to be an efficient way of organising things so that the novel will have a structure I am happy with, able to move between characters and plots without me losing my way or padding things out unnecessarily. Don't waste the reader's time! 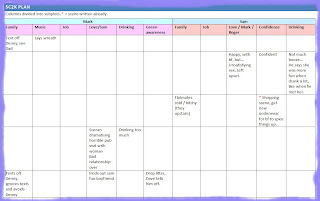 If you try a system like this you could have the table run horizontally left to right, or just draw it on paper as a kind of mindmap with arrows directing the sequence of events, or even write the details on coloured bits of paper (a different colour for each character, or each sub plot) and arrange them on the floor - this last system makes rearranging and trying new possibilities much easier. One of the next steps is to graph out some of the plot lines as time vs emotional impact (varying scenes with high impact and scenes with lower impact so there is a flow), or time vs mood (such as upper or downer - again, you don't want a single tone throughout the novel). That's something I may cover on another day though. I hope this made sense, it is tricky to explain processes that I do instinctively to help me write better novels. This system also lets me isolate and work on just one or two sub plots by just using their columns; and to make sure that scenes generally have two or more characters so that there can be interaction (the lifeblood of most stories), rather than too many scenes of just one person (thinking scenes, which slow things down). I think this system should work whatever the genre. There is a spectrum between pace and character. Turner was at the pace end of the spectrum (being a survival horror/thriller), whereas Cold Fusion 2000 is at the other. character, end (being a more literary novel). I use this as one of the defining points for genres, where novels fall on the scale. There's no good or bad. But plotting like this works whether you are tightly pacing events to keep momentum rolling, or plotting more internal events such as changing values, reactions, and mental progressions or regressions. If you're a writer, what system do you use for plotting out your novels and stories? When I was at uni (before computers) and hand wrote essays I always planned my essay. I wrote out all the main points I needed to address, put them in a logical order, then worked through them paragraph by paragraph. Strangely, once I started writing with a computer, I failed to do the same level of planning. Although this is nothing like restructuring a novel.